Among the surging crowds of this year’s Women’s March last weekend, Indigenous women banded together by identifying themselves with regalia or red scarves. As they joined hundreds of thousands of women across the nation in protest of the broader misogyny represented by President Donald Trump and other national leaders, these Indigenous women were also protesting deeper injustices in Indian Country, especially thousands of missing and murdered Indigenous women. This year’s Women’s March followed a wave of allegations of sexual misconduct by powerful men helped by the #MeToo movement, a social media-driven show of solidarity between people affected by sexual harassment and assault. And while the cultural shift in how we discuss sexually predatory men has changed for the better (and was long overdue), women of color have said they feel the movement is often not inclusive or representative of their experiences. For Native communities this means calling even more attention to the number of missing and murdered Indigenous women, or #MMIW. The exact number of women is unknown, and a lack of widespread attention to the issue remains, further illustrating Indigenous marginalization. 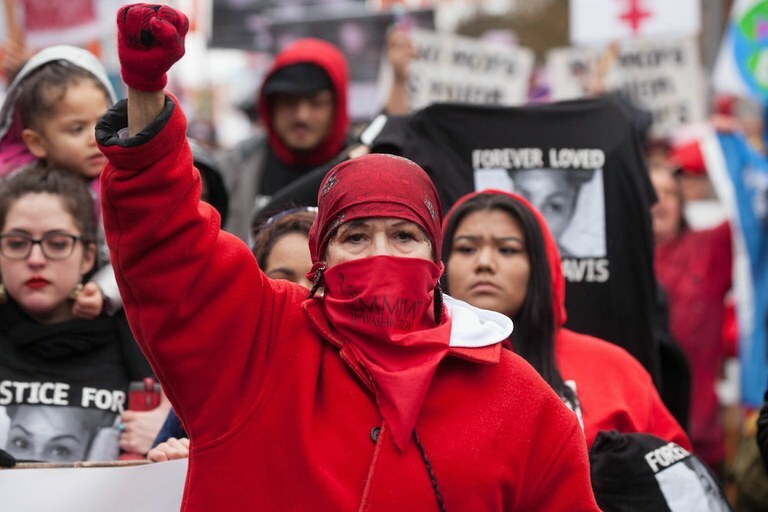 A member of the Murdered and Missing Indigenous Women’s contingent leads the Seattle Women’s March 2.0 in Seattle this January. “If this was a white woman’s issue, if there were white women murdered and missing on this level, this would be a national issue. Something would be done about it,” Eve Reyes-Aguirre, a Izkaloteka Mexica woman running for Senate in Arizona, told me recently. She was one of the many Indigenous women who marched in Arizona last weekend, and bringing her peoples’ issues to the forefront was a catalyst for her campaign. The fetishization of Indigenous women is embedded in our country’s DNA. The plundering of their bodies was part of this nation’s birth. It is one of many legacies that endures to this day. As we discussed in this analysis, the sexualization of Native women comes at a high price. Today, more than 80 percent of Native women experience violence in their lifetime, according to the U.S. Department of Justice. More than one in three Native women are raped in their lifetime, more than twice the national average. Reyes-Aguirre also noted the problem persists for Native men. The rates of violent victimization for both males and females are higher for Native Americans than for all races, according to the federal government. Native men are the most likely to be killed by police. One third of Native Americans reported recently they avoid calling authorities altogether, even when they need help. This sexualization and violence culminates in missing and murdered Indigenous women. Thankfully, there are organizations being formed to specifically address the issue, even as generations of institutionalized violence goes unaddressed by our elected leaders. Just as the #MeToo movement is demanding we hold those in positions of power accountable, the #MMIW movement demands accountability from the authorities tasked with keeping Native communities safe. Combining these issues — in public discussions, mass protests, or deeper reform efforts — won’t dilute any message that demands more respect and acknowledgment of our nation’s least visible and most vulnerable.